The internet is oozing with opportunities to create your online personal space and… why not, earn money from doing so. However, without a structured approach, it can be quite impossible to make your voice heard in the online world. This is the reason of this article, to help you get a grasp of how you could lodge your sparkling idea in the online medium and make money from it. This type of content helps people in their process of purchasing goods of all kinds. From short products reviews to whole buying guides, you can list information, comments and opinions about this and that product, that might help users make a decision. This is a kind of online supermarket, where shoppers can find pretty much everything they need. Although it’s a complex process to create a general eCommerce store, building such a website can also be rewarding. If a general eCommerce store is too complex to build, you can focus on creating a niche eCommerce store. You can sell just 1 or 2 products and concentrate your efforts on maximizing sales for them. You can focus on creating a website that provides some little help to users to want to: compress image files, count the number of characters in a phrase, eliminate the background of some pictures, etc. In a blog, you’re free to write just about everything you want. If it’s a personal blog, then you can tackle hobbies, or whatever is of interest to you. Another option is to build a website that’s destined to gather a community of people sharing the same interests. You’ll moderate comments and grow your community as new topics are included and new invitations to contribute are published. People like psychology tests. They like interactivity, after all. You might want to try your hand at building such a website and help people discover new things about themselves. Would you like your website to be a news catalyser and make it a one stop point for users searching to get informed? Then, content/news aggregators might be just the website type you want to choose. A Resume / portfolio website should serve as a recommendation for your skills in a specific area. You can include pas and current projects, as well as a description of your educational and professional background. You can choose to entertain users and build a website just for fun. Or you can astonish visitors with piping-hot novelties. By choosing newsletters as your main type of content, you do a great service to the users. You aggregate up-to-date information and turn it into an information hub people will want to get driven to. As news (on any topic) are so disparate in the digital world, they will be more than content to find them gathered into one single place: your website. This reduces the need for research and eases their life. Sooner or later, you will be rewarded for your initiative. Although intended for people that will buy a product/service, a buyer’s guide belongs rather to the “I-want-to-know” category. It is designed with the users’ needs in mind, particularly their need to be informed, before going further into the buying cycle. A buyer’s guide will tell them what to consider before a purchase is done, what aspects to take into consideration, what to be careful at and what product characteristics to search for . Product reviews also fall into the category “I-want-to-know”. One chooses to read a product review way before he/she pushes the “Buy” button. Product reviews are useful as they help users stay current and make more informed buying decisions. If they study several reviews of one product, they can form an idea of the quality standards that product meets. Moreover, if they study reviews of similar products, they can make comparisons, and turn towards the best choice (be it quality/price ratio, high quality, low price, etc .). You can find some examples here. Websites containing recipes and diets go into details about meal ingredients or foods to eat on a diet. This concerns a wide majority of people who want to get slim and stay fit or eat healthy. 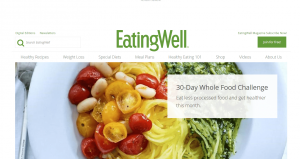 See Eatingwell.com website for examples. Checklists gather users’ needs both to know and to do, under the same umbrella. By providing checklists, you’ll give visitors actionable plans to follow, to achieve good results in their work. E.g. an SEO checklist guides the users through different areas that should be checked for a thorough SEO analysis. Such a checklist accompanies users in gaining hands-on experience in their area of interest, merging theory and practice in a useful way. Similar to sites with tips and tricks, sites containing best practices in a particular area are welcome both for the informational side and for the practical side of the articles. The difference stays in how elaborate the explanations are, as the information is developed in a more professional way, and it spans a wider area of experience from people active in an area. You can take some news and present them your proper way. In addition, you can add your own opinion about a certain event and invite to further discussions about the subject. The goal is to express unique, personal opinions that are a good starting point for debate. There should be an explanation for anything. But which one? How’s water boiling at 100 degrees, or why people yawn out of the blue? People want to know interesting things, even if they have no immediate practicality. The only thing that matters is that the information can be useful “at some point”. Write about some of them and you’ll reduce the number of no-answer questions of web surfers. This should be funny and rewarding at the same time. In case you want to position yourself as an expert in an industry you are active in, showcasing industry news and attaching proper opinions about them should be more than valuable. Industry peers will find such information useful and help you grow your brand steadily. As a blogger, you might want to reach out to key influencers in your area and interview them. Setting up interviews can be a win-win-win solution. Let us explain: people will benefit from relevant experience and knowledge brought to their doorstep. Influencer will benefit from expanding their reach to new, untapped audiences. You will benefit yourself from growing your audience and, consequently, website traffic. People love to investigate and think back to the origins of almost… everything. Such information belongs rather to the discovery realm, and there’s a wide audience waiting to turn into your fans. Fans of your explanations, investigations and digging to the origins. See this example, for the history of pens. This information type may have similarities with other types named above. However, case studies bring in some in-depth analysis that can’t be found otherwise. Focus on creating unique articles and carefully choose the case to study. With a thorough analysis, you have all chances to delight your audience. Envisage to write testimonials if you run a blog for a company. Testimonials will give you material to present to new users and create a snowball effect with regards to the traffic and customer numbers. This idea implies a lot of interactivity, and foster implication of the users to the point of giving precise answers regarding certain subjects. It might also prove profitable for you and companies that benefit from such polls and surveys launched for the larger audience ever: the online world. A classic idea of interactive website is to include events in your website. One solution is to host such events, whereas participants will come, subscribe and be present at online conferences and discussions. Another solution is to present events taking place in the next weeks, nearby. Whichever solution appeals to you, go for it. Your chances to make your website known are high. People are looking for help. In different cases – when they need help. The easiest way to do this is to search for it online. Here comes your website in. Speak to them in a casual tone, giving practical advice on whatever problem you have experienced before. Help them, and they will turn back to you. To write about books can prove to be not only a simple hobby, but a lucrative one. People love to know what books are in trend, buy best sellers and read them. If you open a door to the books you appreciate, you might be surprised of how many followers you attract. And your site will live a long life. If you are a globe-trotter, no better idea will replace that of writing down your travelling experience. The articles will be much appreciated by fellow tourists and people that are passionate about travelling all around the globe. You can include tips and tricks, as the most valuable information refers to what users cannot generally find in traditional online tourist guides. As an inhabitant of a certain town, you are likely accustomed to the general atmosphere, and you know well the town’s history, changes, economic status, cultural aspects and traditions, or people’s manners. Take your knowledge to an upper level, write down about your town. Tourists will be more than delighted to find out about the town’s specificities right from its inhabitant. This content format has the privilege to quickly catch readers’ attention. You can play with any kind of items easy to be organized in lists: it might be business ideas, points to consider in a debate. It might also be ideas for effectively cleaning a house, or daily habits that’ll help readers stay in control of their schedule most of the time. Lists are perfectly adapted to online reading, as they’re simple to scan, quick to complete and actionable. For those driven by passion for photography, creating a photography website is an excellent idea. It’ll help you (the photographer) centralize all your wonderful photos in one place, and it’ll help readers enjoy watching beautiful images in beautiful albums. The albums might be grouped by categories (nature, people, the unusual, etc.) and the result will be a website designed as an artwork. Highly useful for following activities in a certain area, calendars of events are nice to put in a website. It’s an idea that should be considered, as promising in terms of constant traffic. An online calendar of events keeps readers return to the website on a constant basis, in search for the latest happenings in their area of interest. Such sections are easy to follow and even bookmark for checking future updates. They give readers the possibility to stay up-to-date with the latest activities in their field and might even simplify their participation in some of these events. Another source of inspiration for website content ideas resides in consulting comments to the articles. This is valid for blogs where authors have already started writing posts. Carefully checking comments (non-spam comments) of your own blog, or of other blogs, might prove a well of new website ideas. Moreover, comments are signals of what directly interests an audience, so they might generate ideas perfectly meeting readers’ expectations. You can envisage building a website starting from the idea of publishing slideshares. These are professional presentations made in PowerPoint, videos, infographics or other documents. By hosting such presentations, you’ll be of real help to people searching for useful information in their activity area, or else to people willing to find a source of inspiration for their own professional presentations. The most popular website hosting presentation is LinkedIn SlideShare. You should give surveys a place in your website ideas list. And you should give them a chance in engaging readers with your website. Surveys are made up of multiple questions across a wide range of question types. They are useful for further analyses of a situation, which might prove extremely rewarding for you (the website owner): just think of marketing research, and how eager marketers are to be in possession of answers and valuable findings about target audiences. You will be paid accordingly, in exchange for that information. Also, readers can be rewarded for completing surveys, either with money or products/services. Have you thought of creating a website as a collection of interviews? This is a website idea that’s worth polishing and perfecting. Whereas it’s not simple to reach those people you find interesting to interview, it’s also an idea that can easily differentiate you from the rest, in the online world. People will love to check for interviews and memorable experiences, especially if they include experts they’d gladly follow. See the example of “The Talks”. This option is an invitation to take a peek into analytics and other websites’ performance. See what’s popular and highly appreciated by the readers. Determine what their concerns are and how you can respond to them better with your own solutions, exposed on your own website. You should consider designing complete answers to that audience’s questions, so they find your website a cornerstone in their spotting and implementing solutions to problems. Another type of content that people love to visit online refers to webinars. They are web-based seminars suited for presentations, live sessions of questions and answers, all of them including opportunities to find educational content of use for certain activity areas. Hosting webinars on your website might bring you a lot of traffic, and returning visitors interested in such educational seminars. See how such content looks like, in a website. We’ve already mentioned “surveys” in the list of website ideas. On the flip side, you can build a website that’s focused rather on results, figures and statistics than on surveys and questionnaires. People are tempted to rely on facts, proven figures and true statistics. So, consider starting a website that, with statistics, confirms or invalidates suppositions in marketing, software usability, psychology, buying behavior, etc. You’re the inquisitive mind that wants to put everything to question. So, you’re more than delighted to run some personal experiments and share the process & results with other people. You might want to see what works best – a minutely organized daily program, or bulk tasks you’ll quickly and efficiently accomplish in one shot? And the list can go further, as you like. Share the findings with your website readers, they’ll be pleased to take over from you and continue experimenting. People that are active in a certain industry need to be informed, exchange ideas and experience, and be involved in what are the major concerns for that industry. So, a good website idea would be to approach popular topics relevant for an activity area, present the situation and launch discussions or debates around key issues. See, for instance, the online magazine for small and medium enterprises, Small Biz Trends. Whether you’re an expert in personal development coaching or a beginner, you can still tackle some issues people are facing, just like you. So, starting from personal development, you can turn a website idea into a real opportunity for people to change their lives for the better. As a beginner, you can start small, and record minor obstacles that have helped you improve your personality. As a coach, building a website is nothing more than putting online parts of a life that’s rich in experiences, experiments and “exploits”. A well-known personal development website you’ve probably heard of is this. Maybe it’s a good idea to start a website with some simple content. Quotes come in handy, and you can insert even some room for debate around them. 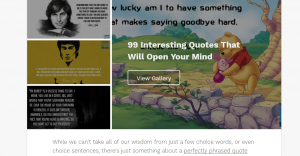 Thus, you’ll have quotations from famous people, and you’ll have user-generated content around those statements. Isn’t it simple? So, for instance, you can create a calendar with 365 inspiring quotes for the year to come. And your creativity will surely give you more ideas as to the ways you can best organize quotations. Another idea for starting a website is to focus on career development (counselling). You can include tips and tricks for people to easily adapt to a new job, recommendations on how they can discover their skills and true talent, and counselling on how to stay true to one’s already selected career path. You can also use your own career examples and make thorough analyses on what went wrong and what went right at every step in your career development. See this example below regarding career development advice and recommendations. This website idea is somehow linked to personal development and career development. What makes it different is that it includes favourable results you managed to achieve by following a certain development route. It can serve as a model for many people wanting to find their way to success. Or it can serve as an example attesting that success can really be attained. Would you like to share your personal success story with other people, on a website? Here is an example of how Experience Life gathers plenty of success stories on the website pages. You’ll be surprised to find that there are people interested in theories specific to an industry niche. They want to be in the know and reach an expert level regarding that industry niche. You can present to them some popular theories and give explanations to how they were formed or how they influence that niche. Also, you can list arguments pro and against the respective theories, and wholly cover the subject for complete presentations. Example of a website covering theories of a certain industry. It might be a challenge to enter some form of routine (i.e. regularly writing on your blog). Or it might be a challenge to learn skating. Or else, more audacious, you might want to overcome some aversions and do things that are contrary to your liking. Whatever the challenge might be (to yourself or the others), it’s nice to share the experiences with an online audience. You can document every step of the new challenge and invite others to be part of the interesting experience. Here is an article presenting 52 ways to challenge yourself in 2018. You can use your website/blog for generating discussions around clichés. Take the overused statements one by one, list pros and cons and invite to further analysis. Moderate discussions and debates around facts that are taken for granted most of the time, without much original thinking or personal input. Your website idea should trigger originality, personal analysis and discriminating intelligence. You can create a community that’ll sustain your website and make it perform well in the online medium. See, for instance, the example of Thebalancecareers.com. Some people are constantly searching for new music. New to them or newly released songs, such pieces will be subject to exploration, taking them farther from already known songs. Although you cannot rely solely on song recommendations for an entire website/blog, these might be a website content idea that’s worth your attention. You can publish recommendations for the song of the day or suggestions for music of the week, and then check ratings from people who listened to them. Here is a post listing music in a top 100 songs. Your website idea might be to host whiteboard sessions. These are video presentations with demonstrations on a subject, revealed by writing on a whiteboard, commenting and explaining things in the meantime. Whiteboard sessions might be current “theories” specific to an industry, that have been formed as a result of repetitive experiences. Such data is shared with the online audience, with the goal to inform and help people make better decisions. Here’s an example of the Moz blog section dedicated to whiteboards. You might want to host podcasts on your website/blog. They’re easy to consume pieces of information, in an audio format that’s been growing more and more popular. They might be podcasts on a certain subject, or you can publish podcasts covering a wide range of topics of interest to your audience. Also, you can add podcasts to your website/blog as complementary to written articles. Here’s an example of an article dedicated to podcasts recommendations. What’s best than publishing anecdotes? Publishing personal anecdotes. People will love to come to your website and take a pause from frowning at the daily problems. Sparkle anecdotes throughout your website/blog and entertain readers who are eager to smile or even laugh at good jokes. You’ll be their ally in having a good time surfing the web, and they’ll want to revisit your website for more. Does this perspective appeal to you? See the example of Anecdote.com, which takes the topic a little further. You might want to inform people interested in a particular industry, regarding past facts, changes and events. It’s a good idea to start a website about that industry history, and list all that might be of interest/or useful for your readers. An example is the history of the Google search engine, with all algorithm changes that took place from the very beginning to the moment. Related to this might be the history of search engines (Google and Bing – formerly MSN, Yahoo, AltaVista, etc.) or the history of search (with a focus on users’ behavior in search). As you can see, there are different paths you can follow, when it comes to the history of an industry you know well or are interested into. Check this website section dedicated to Google history. There are web surfers who prefer turning to recordings of a text being read, rather than read entire pages themselves. Would you like your website to be one that provides resources of this type? You’ll help those people a lot. When they’re pausing from daily tasks, they’ll want to listen to an audio book and relax. So, they’ll gladly come to your website, in search for such content. 101 guides are comprehensive content pieces that claim their right to covering a subject in-depth. It might be any subject (from travelling to fashion or finance) and it must be treated with attention to all aspects and details. Needless to say, your audience will love complete guides that are one-stop points where they find all they need regarding a specific topic. Also, 101 guides should entitle you as an expert on topics you tackle in your website pages. Check a collection of 101 travel guides. Ultimate guides are another version of 101 guides, only less… numbered. They also treat subjects in-depth and cover all aspects of a problem. The idea is to provide users all the information they need, so there’s no need for them to search elsewhere. Would you like to take this challenge, and choose ultimate guides as one of your website ideas? A source of inspiration for your website might be seasonal material. You can write articles about events specific to every month, in your geographic area or spinning around a certain major topic. Conferences, meetings, interviews, or holidays, or seasonal markets are only some examples you can draw your inspiration from. Everybody likes to know things in advance. Especially if it’s about the industry they’re active in. Hence, you might think to dedicate your website to trends predictions and industry forecasting. If you have the possibility to document your content with figures and statistics, and some analytics, it’s excellent. Your website be seen as a trustworthy source where users will like to return for reading your predictions. Check a growth forecast for the toy industry. An excellent website idea, for raising engagement and the number of returning visitors, is to publish posts in (e.g. weekly) sequences. So, every post will have a continuation in a future sequence, so you keep up your readers’ curiosity. And every new sequence has a background that users must know before continuing to read. To create blog post sequences, you should have a propensity to use a narrative style, and an appropriate format that keeps readers engaged. See the example of Lesswrong.com. It’s common practice for bloggers to resubmit some posts to their readers’ attention. These are most popular articles of a year, or top articles that received comments throughout that year. It’s also a technique for promoting the best content to an audience event larger than the one those blog posts initially had. Resurfacing some articles creates new opportunities for content ideas. Also, with the goal of generating new website content ideas, you can use these two techniques: merging posts and recycling old posts. Merge posts that cover different sides of the same topic and create a long-form article that readers will find useful to return to. Or else, recycle old posts, add new information, tweaks and refines, and republish them by inviting users to read them from a new perspective. You can make your website a distribution center for press releases. You’ll feed the website with content from press releases, whereas companies will want to submit their announcements on your website and thus use your own media distribution channel. The first step to creating user-generated content is to build a community. Once you’ve gathered a considerable audience, you might want to launch some debates around the topics of your choice and start bringing user-generated content to your website. An idea for your new website would be to offer reseller hosting. You will pay for web hosting wholesale and allot a portion of the hard drive space and bandwidth towards hosting your own customers’ sites on behalf of the original hosting company. It’s also a source of income you might want to consider. See, for instance, Hostgator.com’s reseller hosting plans. Another website idea would be to create job boards for a specific industry niche. All interested people will check the announcements on your website, and they might find some new opportunities at a click’s distance. See the example of Hardwarejobs.ie. You might want to create a website dedicated to a certain industry (e.g. advertising). Therefore, you’ll want to publish industry-related news, comments, analyses, statistics and case studies. You’ll want to centralize them so people active in the industry can check the latest trends, news and information regarding their topics of interest. It’s nice to keep a record of the events taking place in your town: today, this week, this month. And it’s nice to keep readers informed of upcoming events near them. Whenever they want to go outside, they’ll check your website. See the example of Wheremilan.com. This supposes you have enough resources to provide educational material and research papers on your website. Also, they should be reliable sources that are worth sharing with your readers. The audience you’ll gain might include students or even professionals in that area who want to go in-depth with their study of particular issues they encounter. See the example of Researchgate.net. People, especially ladies, love to read posts related to lifestyle. If you feel like you can bring some new perspectives, or get involved in presenting lifestyle-related topics, this website idea is for you. If you’re a fashionist and would like to explain fashion trends the way you interpret them, to a whole world online, then start a website about fashion trends. And yes, you’ll have enough material to write about, no matter the season. This implies you’re passionate about gaming, and you’re up to date with the news in this field. Talk about such news on your website and involve readers in sharing their opinions with you. This is an idea that might arise from a hobby: watching films, old and new, and keep current with the latest releases. Thus, having formed a background and culture in this area, you can easily write film chronicles that enrich others’ film experiences. If you’re passionate about sports, you can also write about them. Make this your main website idea, or combine posts about your favourite sports with others, in additional niches. 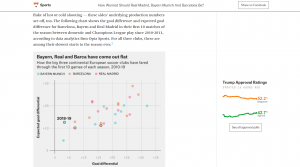 Include posts about sports events, comments and reflections, or analyses of matches, highlighting what this or that team did wrong, which were the correct moves, etc. Another website idea would be to write about your unusual hobbies. Share less-common experiences with others, who will pleasantly read your articles and follow your posts on a regular basis. E.g. tree planting or tree shaping. When it comes to health and fitness, there’s no redundant website. You can start a website from the idea of speaking health and fitness in your own words, telling about our personal experience. If you like to speak about comfort and wellness, then it’s a good idea to start a website from this: spas, natural medicine, wellness, treatment resorts and how all this can improve life. Make sure your pages breathe wellness, and people will highly appreciate your website. You might have pets or like to have pets. 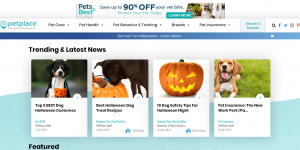 So, pets can love you so much that they’ll inspire you to start a website. And write about them. There’s much you can include in such a website, like pets’ behavior, ways to train them or photos and descriptions of breed characteristics. This idea relates somehow to travel blogs/websites. But it adds some extra charm to them: the adventure element that many people appreciate reading about, if not experimenting themselves. See the example of Adventurousmiriam.com. Handmade products have become increasingly popular, and many choose them for gifts or self-made gifts, or simply house decorations. If you’re one of the persons loving to craft original products by yourself, don’t miss the occasion to write about that, and illustrate the art of manufacturing on your own website. See this example of handmade clothing. Some people are more inclined to the financial aspects and money management. If you’re one of them, then you’ll do a great favour to web surfers by sharing your advice, money sparing methods, tips and tricks to live a better life or advanced considerations about economy trends. Real estate market is a pretty lucrative market. So, real estate professionals will more than welcome a new promotion channel, that’ll be your website. You can make it a catalogue and a catalyser of real estate announcements: apartments or villas for rent, houses for sale, or holiday rentals. Photography is a hobby of many people, nowadays. It might be your passion, as well. (If this is the case) what if you brought in a personal touch to photography, and offer it the context of your life and experience/experiments with photography? Will this make photography more impressive, or would images come to life more easily? It’s a website idea that’s worth trying. If you are involved in ecological actions (not a necessary condition, however), you might try your hand at writing about recycling. You’ll have a new chance to raise awareness about how important it is to actively sustain recycling and reuse of waste materials. If you want to share your/others’ knowledge in a professional area, you might want to turn your new website in a learning platform. The courses materials might be videos, audios, texts, tests, and you’ll probably want to show learners their course progress. Maps can be a well of information, for users who know to “read” them. They might be geographical maps, serving the main purpose of helping users get oriented. Also, they might be historical maps, that show (with a little bit of interactivity) i.e. the current organization of a town, as compared to its past labyrinth of streets. They might be cultural maps, pinpointing places of great cultural value. Or they might be maps recording your past and current trips. Gifts will never go obsolete. That’s why creating a website with gift ideas will always be searched for and visited by web surfers. Whenever they run out of ideas as to what gifts to buy and offer to their friends, your website will be at a click’s distance. Together with fashion, jewellery is much appreciated and searched for. Accessories for this and that occasion, jewellery pieces embellish outfits and compete with them in highlighting beauty. So, talking (or selling) jewellery might be a website idea with a long-living course. Always useful, kitchen tips and tricks might feed a whole website dedicated to cooking and food hacks. You can share with others practical advice about food preparation, recipes, etc. As a parent, you can write about parenting. The website might be a guide for moms and future moms, and you can create a community where you’ll start discussions regarding how to educate children, etc. If you’re active in the legal area, and you’re apt for providing legal advice, create a website around such topics. Start building a community by implementing the format of questions and answers. People will appreciate your free support. As a fashion consultant, it’s not only a good idea to start a website, but also feed it with useful advice regarding outfits, accessories, what works best for who, etc. If you find it interesting to be a fashion consultant, you’ll be delighted to take on the adventure of counselling in the online world. You might want to get involved in politics. Starting from such a website idea (around politics), you’ll help people form their opinions and be up to date with what happens in this area. If science and latest research & discoveries are within your area of interest, it might be a good idea to start a website by explaining science to other people. Using plain language and an accessible format, you can make ordinary people understand research, arouse their interest in scientific discoveries, and put them on a track to searching for answers to their questions that have been left unanswered. See, for instance, the magazine titled Science et Vie. Another website idea, that will appeal to those involved in entrepreneurship, is to create a platform for sharing business opportunities. It supposes a community of like-minded people who will gladly exchange information leading to business ideas. Those business ideas will thus be ready to develop in small and medium enterprises. This is an idea that will interest those inclined to discover the mysteries of the future, make predictions and unknot the intricate paths melting into the unknown. Astrology predictions, tarot analyses, numerology principles and dream interpretations are all topics that can be developed into a new website. You can focus on superlatives and write about the best of… everything. This is an idea you can develop by tackling the most diverse topics (best interior designs, best music of artist X, etc.). Also, the website should be an invitation to excellence anyone can contribute to. Imagine hypothetical situations that stretch people’s limits and challenges them to cope with a new state of things. Just like films, a website has the power to draw people into new scenarios, and pushes the boundaries of common understanding, unlocking new perspectives. Here‘s an example from Age of the Sage. A website is a good place for publishing materials destined to learning a new language. Courses, free materials, tests for each completed step in language learning, all these can be included in your website. Make it the ultimate guide on learning some foreign languages. It might be an idea to start a website where users can book tickets for events, concerts, films, theatre, etc. Such a website should be destined to offer tips and tricks to better spend a day’s time. To make the most of each working hour and enjoy spare time to the fullest. You can start from the famous “Time is money” and provide users some methods of better using time to their own advantage. Start a website where people can buy gift cards. Provide discount gift cards from different stores, and make people come to the website for every new purchase. How not to run out of content ideas? Google Trends – it’s a tool for exploring and identifying trending topics you could write about. Subjects are organized by categories, so you can pick the area you want to write about and delve into the opportunities of that area. Google Search Suggestions – it’s a tool that might unlock the writer’s block. As you type a keyword in Google, you’ll be able to check for queries related to the initial keyword, apart from results the search engine displays. So, pick a keyword that defines your area of interest, and start digging the search engine for related keywords (and topics). Reddit – widely known as “the front page of the internet”, Reddit is a huge collection of news, content and debates. A true source of content ideas. Quora – it’s a website organized in the format of questions and answers on a massive amount of topics. Another good source to turn to, in case you want to dig deeper for content ideas. The all-pervading principle of successful digital information is usefulness and adding value to a reader. If this is your case, chances are you can monetize your website idea and get an additional income. There are plenty of opportunities to monetize a website: affiliate and review sites, ads, ecommerce stores, coaches, guides and books, donations (e.g. brainpickings.org), skills presentation, merchandising, etc. Affiliation and review sites will bring you a sales commission for every sale generated by your traffic. Here’s how do to this the right way. Sponsored ads can bring you some money, too. Google will populate your website with contextual ads, based on the topics you tackle in your articles. Check this article to see details about sponsored ads and their value for a website. Ecommerce: by selling products online, you will gain some money directly from the sales you register onto the website. Check this solution for monetization of a network with an ecommerce platform. Guides/coaches/books offer added value and make your users’ life easier through the information you provide to them. In exchange to that information, you will require some payment and you’ll benefit from this monetization option. Check a how-to guide for this monetization option. Donations are another variant of monetization. If people support a cause you preach on the website, they will be more than eager to donate some money for it. Here are some details about this monetization method. Merchandising and e-books (e.g. waitbutwhy.com). Check this article about monetizing a website with merchandising. Skill presentation/portfolio: showcase your skills and your projects, someone amongst your website visitors will notice you and may invite you to take on new projects. Check this article about how to create a successful portfolio site. Premium gated content: you might invite readers to become members of a community for an annual fee, and to get access to premium information (e.g. fs.blog). Here’s how to take profit from gated content. Last, but not least, let’s consider the percentage of uniqueness in your website ideas. We’d like to help you find your own way in the digital medium and build articles users will remember. For this doing, you might take into consideration o mix of topics, that mould perfectly to your personality. This might be a usually overlooked technique, but that has full potential to make you well-known to a wide audience. A real recipe for success! So, tackle multiple areas and focus on giving away valuable information, that users will hardly find elsewhere. Interconnect those areas somehow, so they represent you and create your personal brand identity. So, what website ideas have you decided upon? Share this in the comments below, maybe we’ll take them further to the next level, together. 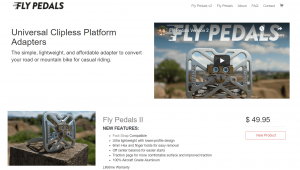 Previous: Previous post: Can Website Builders Work for Your Business? © 2019 ColibriWP. Built using WordPress.